*Sighs. * Forever a classic. I shall never forget when you were drawing this, and the long discussions about the punchline. The Jester is rereading various webcomics out of boredom. I just love the first comic. ‘Nuff said. 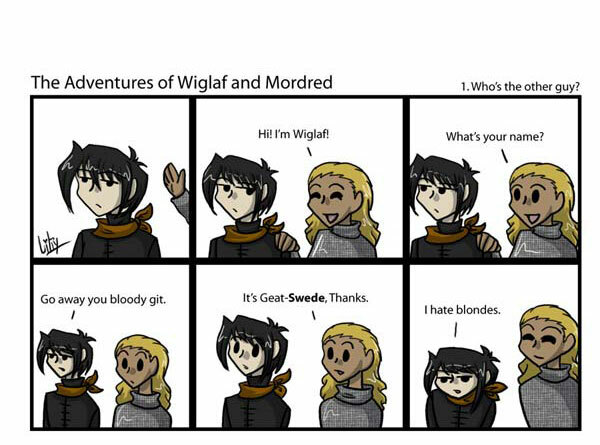 XD Mordred is so cool. And Wiglaf is SO oblivious. when i first read this i didn’t get it, but today i finally read beowulf for the first time XD i get it now!! Liliy, when you drew this, did you imagine WaM would become as complex and awesome as it is now?